How to replicate a google gauge chart in R? 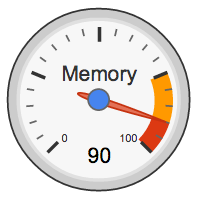 A gauge is a very common chart used in information dashboards; you can use a gauge when you want to show a single value within a given scale. These charts typically show a key indicator within a range of values, employing a semaphoric color code (eg green, yellow, red). Although some people say gauges provide very little information for the amount of space they consume, we’re not going to discuss whether gauges are good or bad, or what type of colors we should use. 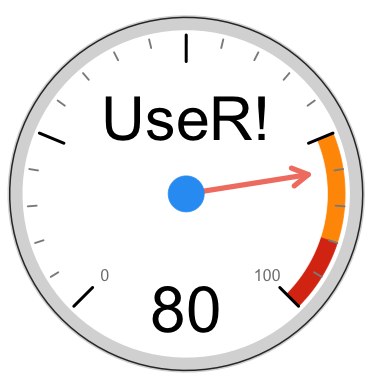 We’re just going to see how we can create gauges in R.
The idea is to break down the chart into its different components so we can have a better idea of how to create a gauge chart in R.
We will need three auxiliary functions to produce the circles, the stripe-bands, and the tick marks around the gauge. Keep in mind that we will be working going back and forth between radians and degrees to get the x-y coordinates of the elements we’re going to plot. To leave a comment for the author, please follow the link and comment on their blog: Data Analysis Visually Enforced » R.